Released in digital format on December 12, 2014. 15 Vocal and one instrumental track. 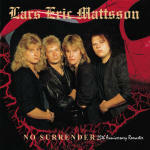 'No Surrender - 25th Anniversary is a re-recorded/remixed version Lars Eric Mattsson’s second album originally released in 1989 to celebrate 25 years since its original release. This new version sees all vocals and guitars being re-recorded with the addition of a previously unreleased bonus track written in 1989 intended for the original release but which was never used. ‘No Surrender’ is classic hard rock fused with neo-classical metal all with the unique Lars Eric Mattsson flavour. Whilst the song writing might not be as advanced as more recent efforts released under the Mattsson name such as “Dreamchild” and “War”, this is a slice of history which shows an artist that has continued to grow over the years since its initial release. This album has been released in a number of different versions sice it's original release, 12 track vinyl (1989), two different CD mixes for Europe and Japan in 1989, Taiwanese and Russian editions, a special "No Surrender + Live" in 2009 as well as this which sees new vocals and a better audio quality added. • Tear Down The Border. • When Silence Came To Remain. • Never Coming Home (2014 Bonus Track). Lars Eric Mattsson – Guitars, Bass, Keys, Lead Vocals.